You can save a lot of money by taking on home improvement and repair tasks on your own. 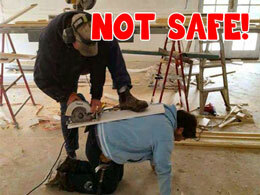 However, you should also know that the DIY sector accounts for tens of thousands of emergency room visits every year. By all means, get started on those tasks, but always keep your personal safety in the front of your mind and do not take chances that could be more costly than the work itself. Here’s how. The most common type of construction injury, DIY projects included, is damage to the eyes. Eye protection (usually in the form of safety glasses) is affordable and easy to find, even online. In most circumstances, a clear lens is the best type of safety glass, but working outdoors may be safer if you use tinted lenses that block UV light. Indoors, using safety glasses with amber lenses can help you see more clearly in dim conditions. 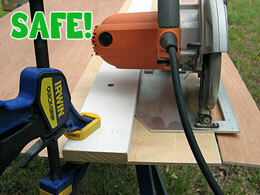 The second most dangerous safety concern for your projects are your power tools. Always use the protective guards that come with table saws, wear safety glasses, and keep your hands well away from the cutting path of blades. Keep in mind that when a blade binds it may kick back on you faster than you are able to react, and place your hands and feet accordingly. Similarly, be careful of wearing loose-fitting clothing that can get caught by a blade or drill bit and drag you into a dangerous situation in the blink of an eye. The top rung on a ladder should never be used as a step, because it drastically alters the center of balance for the ladder and creates a fall potential. Do not attempt to move a ladder with tools on top of it, even with the built-in tool holding slots, as falling tools can cause injuries. Ignoring the superstitious aspects, walking under an extension ladder is dangerous to the person under the ladder and anyone standing on the ladder’s rungs, because one little stumble can bring the whole thing tumbling down. Hand tools like utility knives and hacksaws have a potential to jump off the mark and can easily cause scrapes or cuts. If possible, use clamps to hold the material you are working with in place. If that’s not possible, keep your hands and fingers as far away from the blade and cutting path as possible. The safest method is to hold the material on the side of the tool away from the cutting path, or hold it forward of the cutting path if you are pulling a cutting tool towards you. If possible, use a piece of wood as a cutting guide that blocks the blade from contact with your skin or clothing. Always turn off the power at the circuit breaker when working with wiring. Look around and identify wiring and power lines. Never place a ladder or platform where it can fall against a power line. Contact a utility locator before digging or trenching. Water and electricity never mix. If conditions are damp, turn off the power or postpone the job. Do not allow someone else to hold nails or screws for you to prevent cuts and stab wounds. Before chopping or sawing, take a moment to look at your assistant and make sure they are not in the path of debris, and that they are clear of the area of kickback or arc if the tool should slip. When carrying material together, one person should set their load down first. Never drop tools or material from a height of more than 4 or 5 inches to prevent injuries related to bouncing. These tips cover some of the most common dangers a DIY project entails, but it is far from a complete list. Before using any tool, it is always a good idea to look at the potential dangers it and the environment you use it in could entail. A good start is by actually taking the instructions out and reading them. Otherwise, you’ll be running to find that first aid kit (you hopefully have nearby).